My Favorite Lectures @ HKUST is a series that showcases our students’ favorite lectures conducted by their favorite teachers. All speakers in the series are medalists for the Michael G. Gale Medal for Distinguished Teaching. The lectures will be compiled into an open online course (MOOC), in which these passionate and inspiring speakers would share their teaching philosophy illustrated in the lectures. About Professor DiasA computer network is a set of computers connected together for the purpose of sending and receiving information. The Internet itself can be considered a computer network. The connection between computers can be done via cabling, most commonly the Ethernet cable, or wirelessly through radio waves. Connected computers can share resources, like access to the Internet, printers, file servers, and others. A network is a multipurpose connection, which allows a single computer to do more. Prof. Percy Garvin DIAS is an Associate Professor of Business Education, & Information Systems, Business Statistics and Operations Management Department (ISOM) of the Hong Kong University of Science Technology (HKUST). Professor Dias success as a teacher is demonstrated by the list of teaching awards he has earned, including: the HKUST School of Business and Management’s Franklin Prize for Teaching Excellence (four times), winner of the Best Ten Lecturers award (twice), in 2016, the University’s Michael G. Gale Medal for Distinguished Teaching and, finalist of Hong Kong University Grants Committee teaching award. He was accredited as the Expert Level Instructor (top 10% of instructors globally) by Cisco Networking Academy. In 2017, through Professor Dias’ efforts, HKUST gained the ISACA “Merit Award”in IT Governance Achievement. 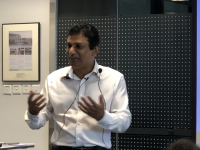 At HKUST, Professor Dias has served on more than twenty education-related committees, and as Director of the Business School’s Center for Business Education, he has responsibility for quality assurance and for enhancement of teaching and learning. Come and check out Infinity War, Interstellar, and Avatar as you’ve never seen and heard them before! What might the opening of an Infinity War sequel look like – since everyone is dead already? What would Infinity War have looked like if Nintendo had made the movie instead of Marvel Comics? What would Interstellar feel like from the abandoned daughter’s perspective while her father goes on an intergalactic adventure to save mankind? Is there any truth to the legend of the UST sea monster? Come find out! See exotic alien bellydances, the magical luminescent forests of Avatar reimagined, and explore the love, legends, and heartbreak of UST! Andrew Horner researches music emotion, sound color, and music analysis/synthesis in the Computer Science & Engineering Department at HKUST. 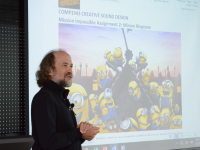 He teaches experiential courses in computer music and creative sound design, and has also included experiential learning in C++ computer programming courses. His training is very interdisciplinary with a bachelor’s degree in music performance and music technology before going on to a PhD in Computer Science. 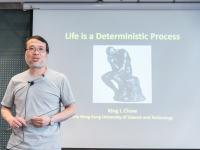 He has received the HKUST Michael Gale Medal for Distinguished Teaching and several School of Engineering Teaching Excellence Appreciation Awards. There has been an old saying that “We are endowed with certain talent and weakness, and everything seems to be pre-determined as our fate.” With the advancement of biological research, genomics and genetics, there are loads of examples illustrating that our genetic composition dictates who we are to a large extent. But, how large? This lecture will go through some of these examples revealing how much it is truth, and how much it is just a myth. King Chow earned his PhD degree in Cell Biology from Baylor Coll. of Med. He was a Belfer Fellow of Molecular Genetics at Albert Einstein Coll. of Med. before joining HKUST more than 20 years ago. At HKUST, he oversaw the development of the Common Core Program, served as Directors of a number of UG and PG programs. He holds the position of the Director of Interdisciplinary Programs Office overseeing the establishment and operation of a number of interdisciplinary programs that cut across all schools. He heads the Center for the Development of Gifted and Talented promoting gifted and STEM education. His own research focuses on molecular genetics of neural development, synthetic and evolutionary biology, exploring animal form, shape and communication. He actively engages in various teaching programs spanning liberal arts, practicum art, life science and interdisciplinary studies. He has taught subjects of his own expertise areas, as well as subjects at the juncture between science, engineering, social science and humanity in different formats, from traditional lectures, group work, exploratory-project-based courses, MOOC to extensive flipped classes at all levels, earning him the School of Science Teaching Award, the Michael G. Gale Medal of distinguished teaching at HKUST. In his lectures, he always provokes students to see information and issues with different perspective, shaking up mythical misunderstanding and help students to reflect on their own value and position, integrating both biotic and abiotic considerations. Understanding oneself is always one of his key objectives in his educational endeavors. Do Chinese Have Romantic Love? Want to learn about whether Chinese have romantic love and how it was studied, but not sure where to kick off that journey? This is a romantic module for you. Michelle received her PhD degree in Social/Personality Psychology from the University of British Columbia. 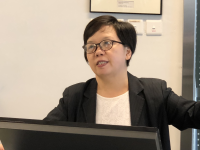 Since 2002, she has been working at the Hong Kong University of Science and Technology where she teaches Psychology & Everyday Life and Personality Psychology. The everyday life course provides ample opportunity to satisfy her “id” impulses of performing in front of 300 students; the personality course provides a platform on which to utilize her research to enrich students’ understanding of human behaviors in the Chinese context. In 2007, Michelle won the Humanities and Social Science Teaching Award; in 2010, she became the medalist for the Michael G. Gale Medal for Distinguished Teaching; and in 2011, she was the finalist for the University Grants Committee Teaching Award.